Port Chicago (122.021W 38.046N) is a small port on the Sacramento River east of San Francisco Bay, with two piers providing deep-water berthings for six ships and facilities for another ten lighters. A naval magazine, with an area of about 7470 acres or 5570 hectares containing over 170 separate bunkers and with rail yards for 650 cars, was built here beginning in February 1942. Beginning in December 1942, munitions were loaded onto ships at the port for transport to the combat areas in the Pacific. Most of the sailors who did the loading were African-Americans. The Port Chicago Disaster. On 17 July 1944 the cargo ships A. E. Bryan and Quinault Victory were docked at the port. A.E. Bryan was almost fully loaded with munitions while Quinault Victory was being prepared for loading. In total, about 5035 tons of munitions were on the two ships or in rail cars on the pier. At 1018 distant witnesses heard a sound like a crane collapsing, followed by two massive explosions within seconds of each other. The explosions destroyed both ships, both piers, and everything on them. The bow of Quinalt Victory was blow 300 ' (100m) into the air, and an aircraft reported metal fragments "as big as a house' blown to an altitude of 9000' (3000m). All 319 men on duty at the pier were killed instantly and another 255 persons in Port Chicago were injured. Only 79 bodies were recovered, and only 51 of these could be identified. Some 80% of the dead were African-Americans, and the subsequent investigation established that these men had received practically no training in handling explosives. The explosion was powerful enough to register on the seismographs of the University of California at Berkeley. Captain William H. Parsons and Dr. Maurice Shapiro, then working at Los Alamos on the atomic bomb program, traveled to Port Chicago and thoroughly investigated the effects of the explosion, which has led to conspiracy theories that the explosion was nuclear in character. These are without basis. The amount of chemical explosives on hand were sufficient to produce the damage observed, and it would be impossible for the radioactive effects of a five kiloton nuclear explosion to go undetected or to be covered up. 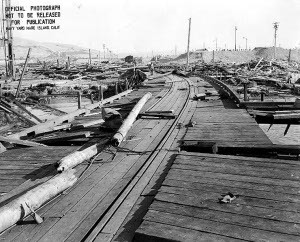 Parsons compared the explosion to the Halifax explosion during the First World War, which resulted in seven times as many deaths, and attributed the lower casualties at Port Chicago to the fact that it was designed as an explosives arsenal. On 9 August 1944, survivors of the disaster were ordered to resume loading explosives aboard ships at Mare Island. Some 256 men refused to return to duty. The 12 Naval District commandant, Carleton Wright, spoke to the men the next day, reminding them that American troops were dying in combat on Saipan and threatening them with execution by firing squad if they continued to refuse orders. 206 of the men who agreed to return to duty were fined three months' pay and given bad conduct discharges by summary courts-martial, while 50 were tried by a general court-martial, convicted of mutiny, and given sentences of 8 to 15 years. The incident became a cause célèbre of the nascent civil rights movement, and the sentences were commuted to time served in January 1946. By January 1945 both piers had been reconstructed and were back in operation.